Oregon is the 27th most populous state in the United States and is also known as The Beaver State. The bordering states are Washington, Idaho, Nevada and California, as well as the Pacific Ocean. 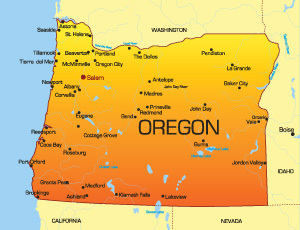 The capital city is Salem but the largest city is Portland, which has a population of over 580,000 people. Major highways in the state are I-5 and I-84. Other modes of transportation such as air travel are facilitated through airports like the Rouge Valley International-Medford Airport. Notable universities in Oregon include The University of Oregon and Portland State University. Tourism is drawn into the state by attractions like the famous Crater Lake National Park and the annual Oregon Shakespeare Festival.